We were upgraded to a bigger apartment when we arrived. Very spacious. Staff was very helpful. Local neighborhood away from the city & the main tours spots. Few minutes away from the train station. Really liked having the kitchen. All was comfy and the staff was very helpful. The pool was nice the train station and walking/jogging path was right next to the hotel. Nice restaurant next door. The breakfast was nice w a nice selection of meats, fruits, breads and cheeses. It was presented nicely and the staff were VERY nice and responsive. The apartment was much nicer than anticipated. Large and spacious. Balcony and kitchen facilities were excellent. The swimming pool area was very pleasant. Great location for sightseeing Rome. Lovely restaurant at the end of the road. The gentleman who checked us in was excellent he took lots of time to introduce us to the hotel and the local area and transportation. Luggage drop off area. The front desk staff were really helpful and friendly with good English. The apartment was a good size and was clean when we arrived. 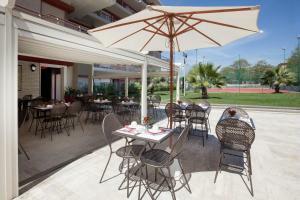 Good location close to bus stop and train station for trips in to Rome central. Pool was clean and not crowded during our stay. We ate at the restaurant next door (Capperi) a couple of times and would certainly also recommend. It was one of the wonderful hotel I ever visited, the hotel and staff were great. I like the place and the lovely view. Forever, the place was cool, comfortable and quiet. Adagio staff really touch my heart when they surprise me for my birthday, I like Adagio and the friendly staff. The lady at the front desk made a great effort to communicate with us in English and made the check in process very smooth. It was also a quiet place to stay and the cleaning staff were very friendly and nice. Lock in a great price for Aparthotel Adagio Rome Vatican – rated 8.1 by recent guests! 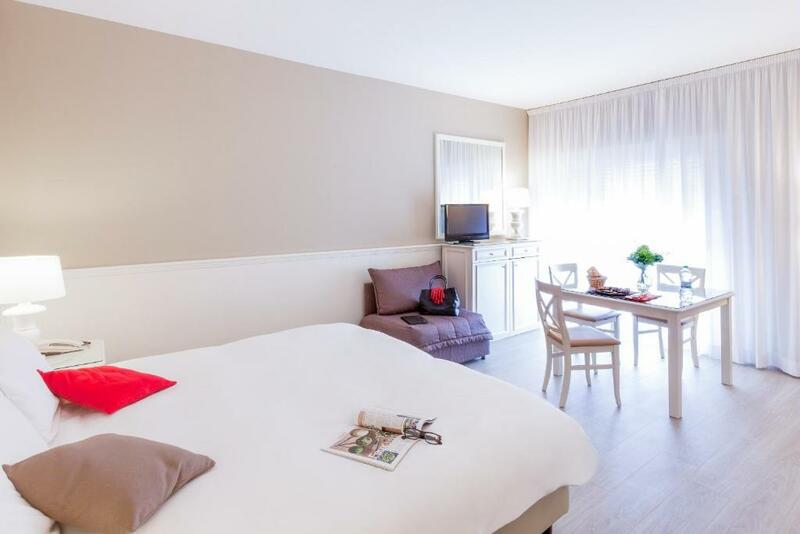 Aparthotel Adagio Rome Vatican This rating is a reflection of how the property compares to the industry standard when it comes to price, facilities and services available. It's based on a self-evaluation by the property. Use this rating to help choose your stay! 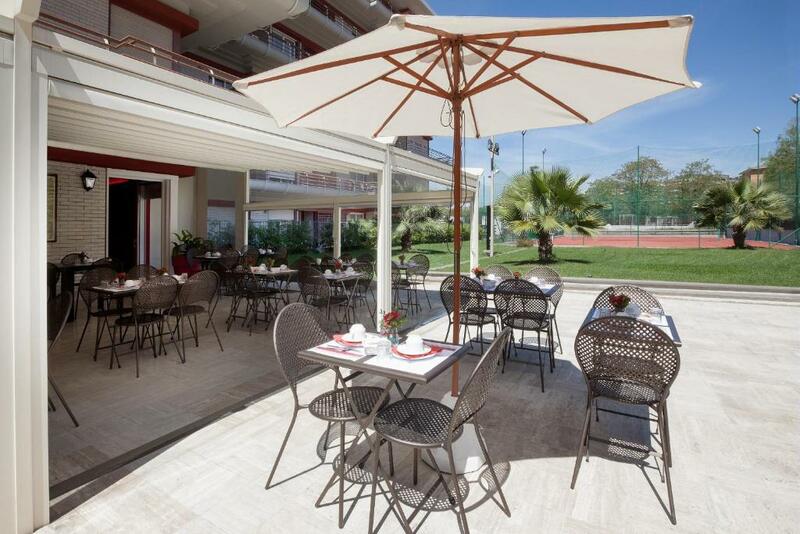 Aparthotel Adagio Rome Vatican is located in a green area of Rome, less than 1.2 mi from Monte Mario Park. 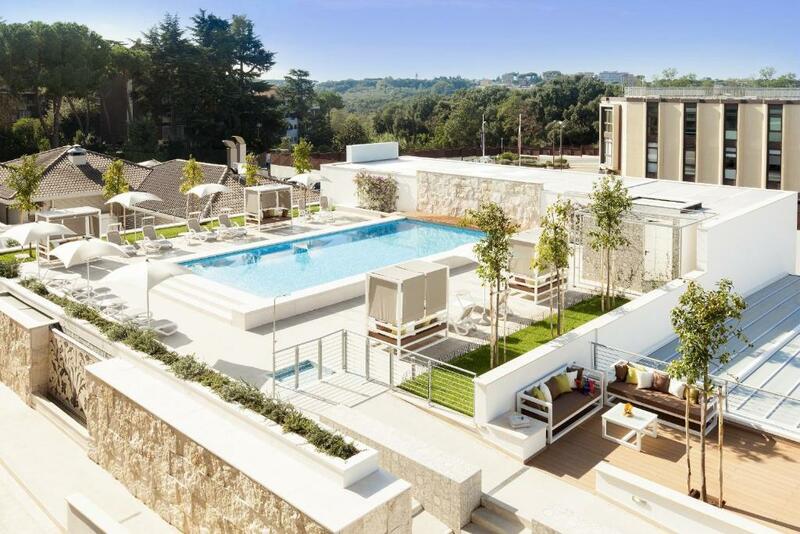 It offers modern rooms and apartments with air conditioning and free WiFi. All of the spacious accommodations features a private balcony, a flat-screen TV with international channels, and an iPod dock. Apartments and studios have an individual safe and a private bathroom with a shower. 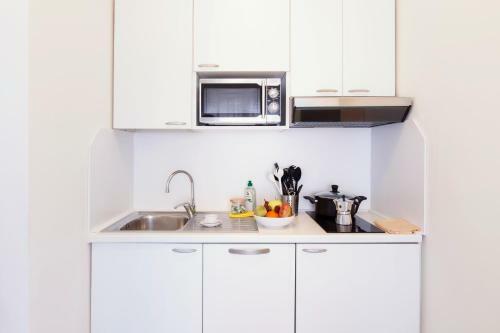 The fully equipped kitchens come with a microwave, stove and fridge. A daily morning buffet is available in the breakfast room. With a 24-hour reception, the aparthotel provides laundry and dry cleaning facilities. Private parking is possible at Adagio Rome Vatican. The nearby Balduina Station, on the FM3 line, is just 2 stops from Valle Aurelia Metro Station, on Rome's Line A. Saint-Pierre Basilica is a 10- minute drive away and the Vatican City is 1.2 mi from the property. When would you like to stay at Aparthotel Adagio Rome Vatican? Offering a balcony and a dishwasher, this spacious air-conditioned apartment features an equipped kitchen, a dining area and iPod dock. This studio has a balcony, oven and iPod dock. This studio has a balcony, tea/coffee maker and kitchen. 10 minutes walk from the Vatican, and 20 minutes from the city’s historic centre, which is accessible via nearby public transport... The best! House Rules Aparthotel Adagio Rome Vatican takes special requests – add in the next step! Aparthotel Adagio Rome Vatican accepts these cards and reserves the right to temporarily hold an amount prior to arrival. Please note that for stays up to to 7 nights, cleaning is available on request. For stays of 8 nights or more, weekly cleaning is included in the rate. Cleaning includes change of towels and bed linen. Advertised as being air conditioned, however air conditioning did not work and as we were on the top floor and the daytime temperatures were in the low 20C’s, it became very uncomfortable and difficult to sleep at night (particularly given quite stuffy and poorly ventilated rooms). Not all of the power cords of the kitchen appliances matched the wall sockets. The bathroom appeared run down with poor drainage and dislodged wall tiles. Also had high additional expenses associated with use of laundry facilities that were advertised as included (cost a total of €9 as you had to buy washing powder, then pay to use washing machine and dryer). Shopping facilities close by had limited range of food products and the inability of apartment staff to assist with provision of basic staples such as sugar, coffee or tea bags without charge made it very difficult given the length of our stay. We felt that for a serviced apartment (which was not cheap on a per night rate), what was provided was very basic. I did not know about tourist tax and had no money to pay at end of my stay.. it would have been beneficial to just bill my card at beginning of the stay for this. The view was of building site works which was disappointing. Plenty of variation of food and sufficient time to enjoy. Construction outside of our apartment. We had issues with our AC as it wouldn’t get cold or stay cold, and made rattling noise through out the evening. So we just opened the doors for fresh/colder air. Don’t use google maps for directions, especially if you’re walking the neighborhood! You will get lost as we did on two nights. Just ask the front desk for the best directions!! No equipment to do sport at all. Swimming pool not available during winter. The space in the appartment. Maybe a couple more towels for staying 4 days. The glass screen on top of the bath to stop water spilling out when showering was ineffective. We raised this at desk twice but to no avail. An explanation of What to do when the FM3 train isn’t running or which train destinations stop at Balduina would be useful guidance to have upfront. Area maps + train maps need to be better. Finding the local small supermarkets wasn’t easy, but good to have one conveniently in front, the neighbourhoods look a bit like some London suburbs rundown. It would be good to know also there is a large supermarket at Valle Aurelia shopping centre too, which we discovered on our last day. The breakfast area is very pleasant but we’re aware of staff having to replenish stock repeatedly to meet demand and there was no check of guests before entering the area so the staff had to ask guests whilst they were picking their breakfast selection. That could be embarrassing. Could have cleaned the apartment at least once during the week for the price. An indoor pool would be nice. Despite all the areas of improvement we enjoyed our stay. Some of it is to do with location and overall customer experience. Spacious Apartment with balcony. Friendly, helpful staff, most if not all amenities catered for. Decent and delicious choice of breakfast. Restaurant on doorstep which adequately makes up for no restaurant facilities in house. Convenient vending machine, purchase of dishwasher tablets and washing machine tablets. The sofa beds were good. Convenient bidet. Property does not look like the pictures. Pictures look very clean and new. Room smelled incredibly dusty and dirty. Was disappointed in this stay. Declined airport shuttle twice via email but hassled about this on arrival. Booked a twin but given an excuse and a double room without a kettle. Staff Stefan was pleasant but unhelpful.